The Province recently highlighted an upcoming match between the UFV Cascades men’s basketball team and the UBC Thunderbirds. 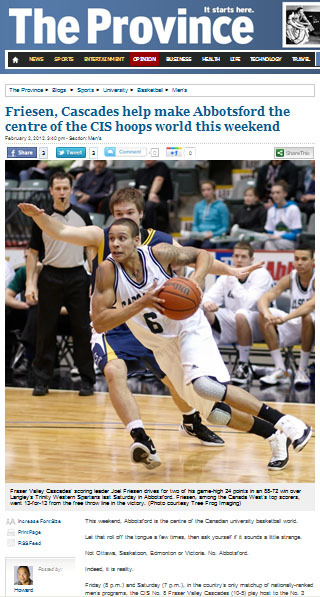 This weekend, Abbotsford is the centre of the Canadian university basketball world. Let that roll off the tongue a few times, then ask yourself if it sounds a little strange. Not Ottawa, Saskatoon, Edmonton or Victoria. No. Abbotsford. Friday (8 p.m.) and Saturday (7 p.m.), in the country’s only matchup of nationally-ranked men’s programs, the CIS No. 8 Fraser Valley Cascades (10-5) play host to the No. 3 UBC Thunderbirds (12-2) at the Envision Athletic Centre. In the stretch drive of the Canada West’s 18-game regular season, with first place in the Pacific Division still to be determined and No. 7 Victoria (11-3) smack dab in the middle of it all, it’s the kind of competitive atmosphere that Cascades head coach Barnaby Craddock and 2008 recruit Joel Friesen each believed was possible when they signed on a to help lead a former college program into Canada’s top level of university competition. And considering the credentials they arrived with and what they have come to represent within the program, perhaps it’s no surprise that the Cascades have continued to improve each season in a conference that regularly fields at least half of the country’s Top 10-ranked teams. “Joel deciding to come here, seeing the light here, was the starting point for our program,” explains Craddock of the fact that Friesen, the 2008 B.C. High School Triple A MVP from neighbouring Yale Secondary, chose to play for the Cascades after leading his team to the B.C. title as the concensus choice as the best guard in the B.C. prep ranks that season. Indeed Craddock’s 2008 recruiting class was a bumper crop. Not only did it yield the 6-foot-4 Friesen, the team’s leading scorer (16.4 points per game), but also fellow guard Sam Freeman (15.1 ppg) from Coquitlam’s Dr. Charles Best, and forward Jasper Moedt (11.1 ppg, rpg 7.3), the latter Friesen’s former teammate at Yale. That trio along with Surrey-Enver Creek forward Kyle Grewal (14.6 ppg, 7.5 rpg) and point guard James York, a Montana Tech transfer, have been among the most essential ingredients to this season’s success as team team’s starting five. Always a player with highlight-reel ability on the offensive end of the floor, Friesen has since become a much more complete player, often times drawing the assignment of guarding the opposition’s top scorer, a task this weekend that could pit him against UBC stars like Doug Plumb, Nathan Yu and Malcolm Williams. “I think he is among the top defenders in our conference, and he has games where he shows his ability to rebound above the rim,” Craddock says of Friesen, last season selected a Canada West all-star. “So when you put that together with his playmaking ability, and the fact that he can really score the basketball, he is one of those guys that can do a little bit of everything. That’s what makes him special. For his part, Friesen is soaking up the atmosphere that comes in the lead-up to big weekends like this one, and in general, doing all of the little things that have helped keep the Cascades a part of the national rankings for 10 straight weeks since debuting at No. 7 in the preseason. *In women’s action, CIS No. 3-ranked UBC (12-2) also plays at second-place Fraser Valley (10-5) Friday (6 p.m.) and Saturday (5 p.m.). UBC is one win away from clinching first place in the Pacific Division.